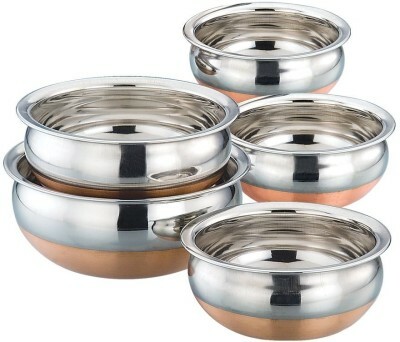 Manya presents this Copper Bottom Purpu Chetty Set which offers you everything you need to cook like a professional. This cookware set consists of 5 handis in diminishing sizes and different capacities. These handis are designed using the finest stainless steel material and finished with copper bottoms for superior heat conduction. These utensils are designed with non-induction bottoms making them ideal for use on gas stoves. You can prepare and serve a variety of dishes to a large group with these handis.